Mitch Minarick, who anticipates completion of his doctoral program this summer, founded FarmAfieldand has partnered with recent University of Illinois agricultural engineering PhD graduate Sid Verma and a diverse set of outside experts to guide the development of the first product offering. The team includes members with backgrounds in agricultural economics, portfolio and commodity risk management, agricultural finance and marketing, computer science, organic agriculture, cattle production, swine production, accountancy, and small family farms. Minarick sees two initial markets for potential investors: those outside of agriculture who want a simple way to be directly involved in the industry, and farmers who grow grain and want an easy way to vertically integrate their operation. “In previous generations, that was one of the reasons farmers had livestock,” Minarick points out. It was during a trip to Sierra Leone that Minarick first envisioned this concept. He accompanied U of I Associate Professors of Agriculture and Consumer Economics Peter Goldsmith and Paul McNamara to the country to assess the bioenergy market for palm oil. They were looking at different parts of the value chain and seeing if there were places for improving inefficiencies and reducing bottlenecks. 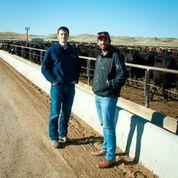 Mitch Minarick and Sid Verma have set a goal to broker 4,000 head of cattle by May 2015. FarmAfield is starting with the feeder cattle market because there are already cattle feeders who provide the service of buying, selling, and feeding the cattle. In these cases, the production contracts are already being sold by a feedlot to larger investors. The FarmAfield team sees a desire among individuals to participate in agriculture more directly, and so they have set out to improve the transparency of producers’ historical performances and reputations, which will enable individuals to make informed choices about who they partner with. “We think we can be more credible as an independent third party whose business model isn’t dependent on favoring any particular producer,” Minarick said. On the flip side, FarmAfield will serve to provide the cattle feeders with access to a larger customer network, an easier platform for customer relations, and a level of transparency regarding potential customers’ historical reputations. A feedlot will post some openings in their pens through FarmAfield and investors could buy one calf or small increments of cattle and track their progress online. Eventually, the same process used for cattle can be used for other livestock and crops. FarmAfield has been applying for Small Business Innovative Research (SBIR) grants while also setting up contacts with feedlots. Only after proving the concept with livestock and produce within the United States will FarmAfield be ready for the worldwide market. The FarmAfield model could have enormous benefit to farmers in underdeveloped countries where less than $2,000 per year can be the difference between making it and collapsing. Because of that, many farmers can’t afford to risk trying the latest technologies to increase yield. With investors burdening the risk, farmers could afford to give those technologies a try, and overall efficiencies could be much higher. This can have much longer-term positive effects than simply providing food aid, where in some instances, the shipment of grain has the unintended consequence of collapsing the local market for that grain. The FarmAfield concept is more like crowdsourcing, when an investor has the advantage of verifying historical returns before deciding which farms in which to invest. “Americans are very generous, but they also don’t want to be throwing money down a black hole, so the feedback loop is very important,” Minarick reiterated. The team is ready for business. Those who wish to invest in as little as one feeder calf can log on to farmafield.com, register their interest, and when a pen with a reputable cattle feeder opens up, investors will be given the opportunity to purchase cattle on a first-come, first-served basis until the pen is full. FarmAfield will arrange the purchase of the cattle and provide the software that enables the investor to keep track of their herd online. 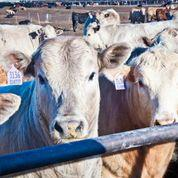 They have set a goal to broker the sale of 4,000 cattle from May 2014-May 2015. If you have any question about the College of Engineering or other story ideas, contact Mike Koon (217/244-1256), writer/editor, Engineering Communications Office, University of Illinois at Urbana-Champaign.